Marvelwood School Science Department Chairman Laurie Doss, left, is shown with Marvelwood School students, from left to right, Oliver Sanchez, Edward Duffy, Allen Nash, George Ryan and Chris Scherer, who recently volunteered their time to use their unmanned aerial vehicle skills to help the Kent Volunteer Fire Department and the National Oceanic and Atmospheric Administration monitor the ice and flooding on the Housatonic River. Students from Marvelwood School in Kent recently showcased one of the school’s four core values, service. 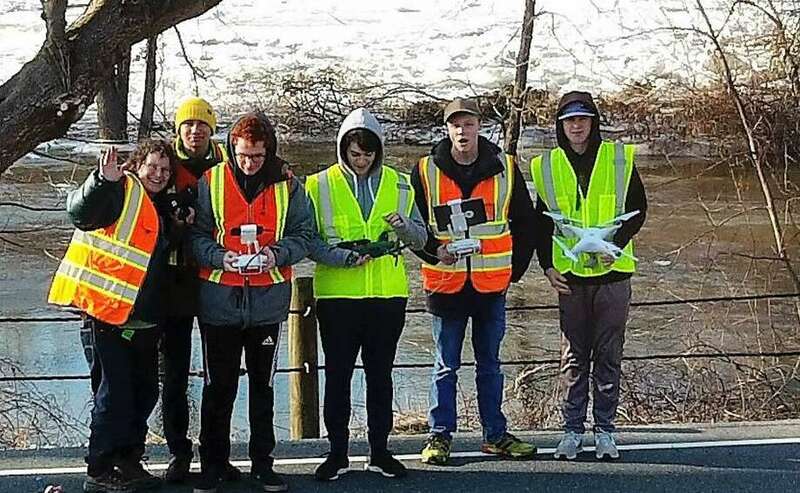 Allan Nash of the class of 2021, Edward Duffy and Oliver Sanchez of the class of 2020, George Ryan of the class of 2022 and Christopher Scherer of the class of 2020 volunteered their time to use their unmanned aerial vehicle skills to help the Kent Volunteer Fire Department and the National Oceanic and Atmospheric Administration monitor the ice and flooding on the Housatonic River in Kent. Part of Route 7 was closed due to flooding in recent weeks.